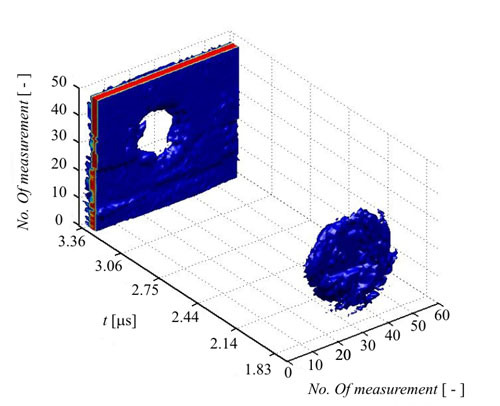 In ultrasonic defectoscopy it is very difficult to detect flaws in materials with coarse-grain structure. Measured ultrasonic signal contains echoes from flaw and echoes from grains included in material. These echoes characterized noise have to be cancelled. 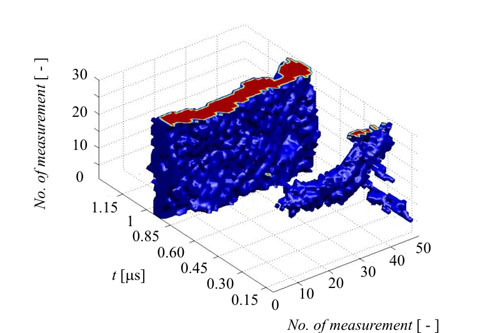 For this purpose we use signal processing method based on discrete wavelet transform. In this work method based on neural networks for flaw detection in B-scan is used. Proposed methods are efficient used for separation of flaw from undesirable echoes. For visualization of flaw volume construction was created. The 3D volume visualization characterizes volumetric depiction of measured material. By using 3D volume visualization of ultrasonic signal it is possible to determine character and place of flaws in ultrasonic defectoscopy. The system for detection of flaw consists of data acquisition, filtering, morphologic processing and the neural network. For detection of flaw a material with artificial circle shaped flaw was used. By mathematical morphology the C-scan sketches the shape of flaw. With application of neural network it is possible to characterize the shape of the flaw exactly. For the comparison a material with coarse grained structure where detection of flaw is difficult was used. Filtering of ultrasonic signal is useful for suppressing echoes from grains. In the future using the 3D volume visualization of ultrasonic signal it will be possible to determine the character and place of a generation of flaws in ultrasonic defectoscopy.